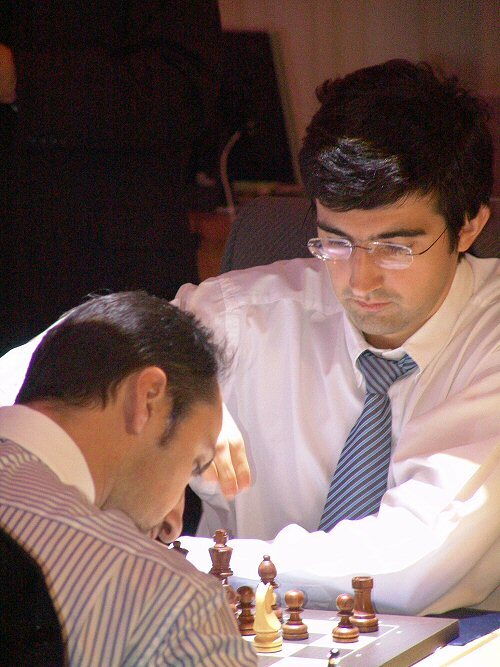 10.10.06 Game 11 of the World Chess Championship Match ended today when Vladimir Kramnik accepted Veselin Topalov's draw offer after 66 moves. This sends the match into its twelfth and final game under classical time control. If Game 12 is decisive, the winner will be declared World Champion. If the game is drawn, the match enters the tie-break phase. We bring you the Game 11 report and what could happen next. The players behind a screen projecting the game to the live audience in Elista, Kalmykia. LIVE Game Link. Watch Game 12 on Thursday, October 12 at 7:00 a.m. Eastern. See REVISED full match schedule below. 3.7.1 If the scores are level after the regular twelve (12) games, after a new drawing of colours, four (4) tie-break games shall be played. 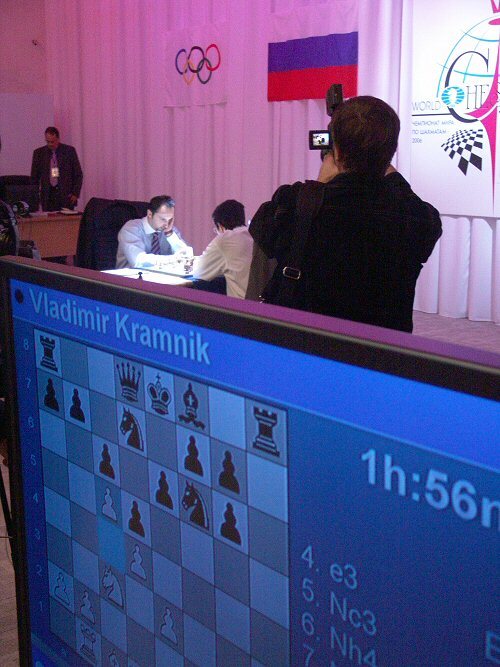 The games shall be played using the electronic clock starting with 25 minutes on the clock for each player with an addition of 10 seconds after each move. 3.7.2 If the scores are level after the games in paragraph 3. 7. 1, then, after a new drawing of colours, two (2) five-minute games shall be played with the addition of 10 seconds after each move. 3.7.3 If the score is still level, the players shall play a single decisive sudden death game. The player, who wins the drawing of lots, may choose the colour. White shall receive 6 minutes, black shall receive 5 minutes, without any addition. In case of a draw the player with the black pieces is declared as winner. The press corps waiting for the players to begin Round 11. 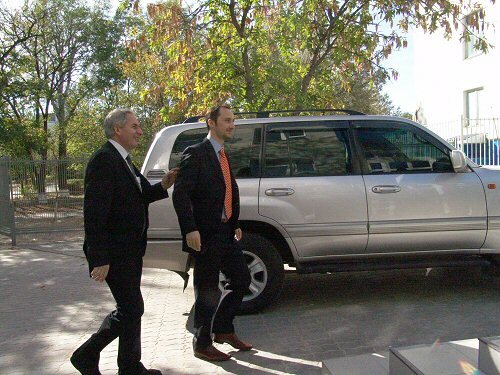 Vladimir Kramnik arrives at the playing site. Veselin Topalov does the same. 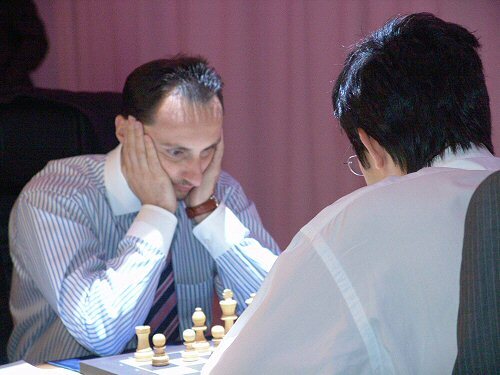 Veselin Topalov offered a draw in Game 11 to send the match into possibly its final game. Vladimir Kramnik will have the white pieces in Game 12.